Improvements are underway at Perry Hall Dog Park to improve the grounds of both the small and large dog areas. The Perry Paw Dog Park Committee, which is part of the Perry Hall Recreation Council, paid $3,630 to re-seed and prepare the soil. The committee also paid to plant a new oak tree in the large dog area. All work was done by Porter Landscaping. Councilman David Marks worked with Lois Lorenz, the head of the Perry Paw Dog Park, to get the approvals for the improvements. “I would like to thank this terrific volunteer committee for spearheading the improvements here, which are needed after more than three years of use,” said Councilman Marks. 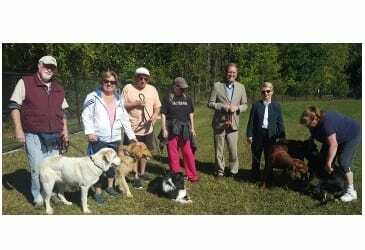 Perry Paw Dog Park opened in the spring of 2014. It is one of four new parks that have opened in Perry Hall since 2010.